I've had this for almost a month now and never got around to using it. That's how crappy I've felt lately. I had brand new makeup sitting in front of me for weeks and I didn't even feel like playing with it. That's a shame, cause this actually turned out to be a really pretty palette once I swatched it. Here's the outer box. I love the thought they put into the packaging. I know it's just a cardboard box, but it's so nice. Gold embossed rosaries printed on the front, opens up like an accordion to reveal a teal-colored inner lining with star accents. 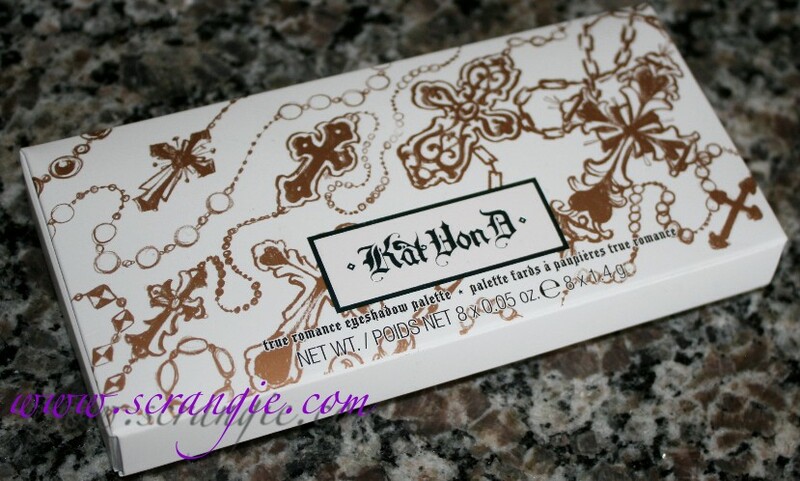 The palette itself is wrapped with pretty metallic paper and sealed with a KVD sticker as always. All the extra touches on the packaging just make everything feel so much more special, like you're opening a present. 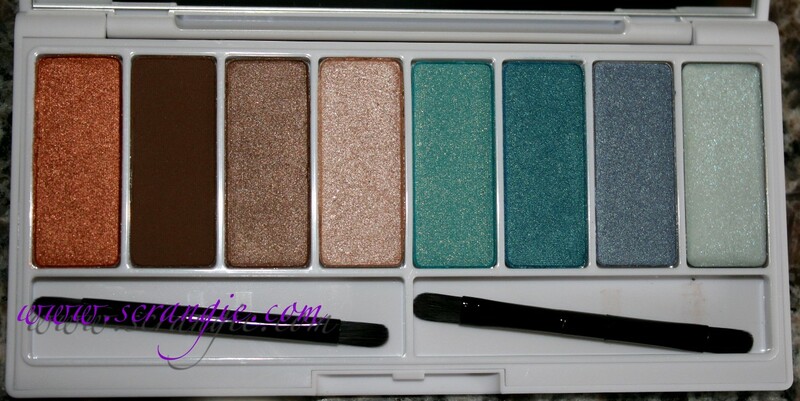 This is the actual palette. The outer box mirrors the case design. 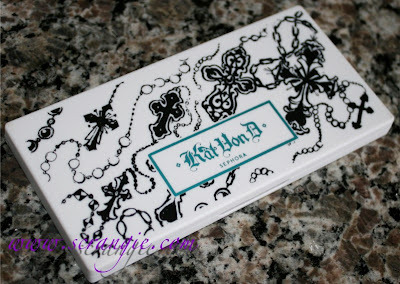 The white plastic case is rubberized feeling and the Kat Von D Sephora logo is printed in teal metallic. With flash and without. 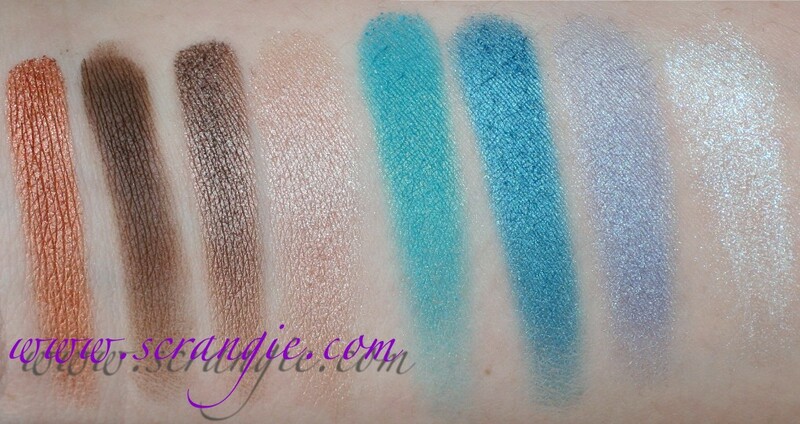 The shades are (left to right): Venus, Leather, Specimen, Rehab, Peggy, Bukowski, Bellbottom and Morphine (which is the only cream shadow in the bunch). Please enlarge these pictures to see the detail in the colors. Venus is a shiny metallic copper penny shade. Specimen is a near-metallic medium-brown taupe shimmer. Bukoswski is a deep teal blue shimmer, slight green iridescence, with a pretty velvety finish. Bellbottom is a greyed slate blue shimmer with a hint of green iridescence. Morphine is a cream shadow and is sheer/clear white with turquoise duochrome shimmer. Swatched over Urban Decay Primer Potion: Venus, Leather, Specimen, Rehab, Peggy, Bukowski, Bellbottom, Morphine. Morphine is applied thickly to show the color, when blended it is very sheer. I haven't actually done a look with this yet, just played with it on the back of my hand. First impression: Too many repeats. Three of the shades were in other palettes and one of them is a cream so it's like you're only getting four shadows in this. I suppose the repeats are a good thing if you don't have all the other palettes, but I feel like they should have come up with something new instead of repeating plain colors. 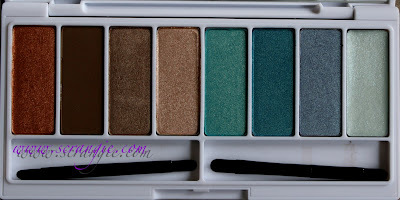 If anything, they should have put that iridescent green/white duochrome from the Gypsy palette in! Pigmentation seems great. 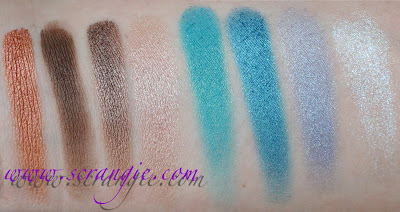 All the shadows felt like silk when I swatched them, but I'll have to use them on my eyes before I make a final judgment. 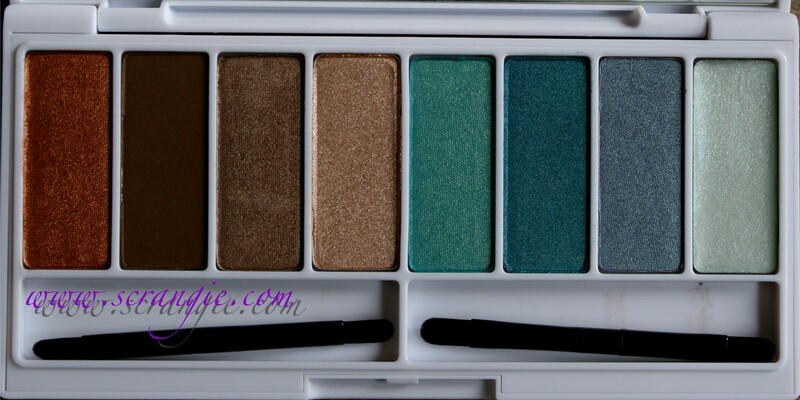 All the colors seem to go well together and once again the shades seem perfectly suited for dark brown eyes. Like always, this has those two silly, useless double-ended mini brushes. Well, useless for applying shadow, at least. They're excellent lip brushes and that's exactly what I use them for. No!!! Please do not do a review of Memento Mori! Everytime I see pictures of it I get depressed because I stupidly passed on it. Haha. This one is pretty AND available though. *Slides over with a creepy smile* "Hey there, baby! Come to Momma!" Woo hoo - thanks for swatching and reviewing this palette. Was looking forward to this! I have several of the Kat von D palettes, so I was a little bummed to hear that there were so many repeats (although at least they are pretty colours). And I prefer powder shadows instead of cream shadows. Hopefully her next palette will have all-new colours and maybe no cream shadow. Also, if they got rid of the brushes and just gave us more of the shadows, I'd love it. Blues don't look that great on me, so half of this palette would be unused. Still, it's really pretty. Memento Mori looks pretty, but it's the Gypsy one I kick myself over, and not just because of the name. Yummy greens & some purple.. wow. I don't have any of her palettes (I do have the blackish lip gloss & it's cool), but if she does another palette like Gypsy, I'm so there. I also look horrible in blues too. I just seem to pass on her line each time I look. I go around the corner and look at UD and T. Tarintino...more my kind of lines typically. 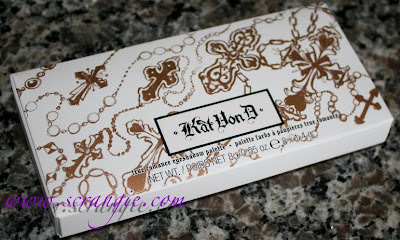 I just can't resist these Kat palettes. I've got them all. I didn't realize there were repeats.